Each time Canon releases a new model in the PowerShot G-series, many amateur, hobbyist and even some semi-pro and professional photographers rejoice. In one moderately sized, highly functional and select-ably automated package you have all the image quality you could possibly want to produce wonderful 8"x10" prints. As long as lighting conditions weren't too far off the normal daylight range or too deeply into the golden hour, the PowerShot G3 and the G6 in particular worked beautifully as a primary camera for the non-pros and as a decent backup for many pros. Canon redesigned the G-series in 2006—with smaller, retro-looking rangefinder styling—and released the PowerShot G7 with lots more photosites packed into the same size sensor which yielded much larger and nicely detailed images. Reading some of the online photography discussion forums thereafter however, you might have gotten the impression that Canon had laid a rotten egg. Nothing could be further from the truth of course, and never let it be said that the equipment freaks and strident technical specification hounds are ever the only people to listen to when deciding on a camera purchase. The major PowerShot G7 flaws touted by the pundits were that this marvelous top-of-the line prosumer camera failed to provide several features offered in semi-pro digital SLR cameras costing hundreds of dollars more. The PowerShot G7 didn't offer RAW format the critics complained, and it failed to provide superb low noise performance above 400 ISO. Canon listened to the howling and rancor, then tweaked the design to add some image processing improvements and RAW file saving. The result is the Canon PowerShot G9. The Canon PowerShot G9 is a 12.1 megapixel digital camera equipped with Canon's DIGIC III image processor, a 6x optical zoom lens and Optical Image Stabilizer (IS). The camera offers a full range of shooting modes (shutter priority, aperture priority, manual, programmed auto, full auto, scene modes, movie mode) and recording modes including JPEG + RAW. Except for the fact that it's blessed with a diopter adjustment, the optical viewfinder is essentially useless at every zoom setting unless it happens to be 12.5mm (equivalent to 50mm on a full frame). Thankfully the viewfinder is completely offset by the 3 inch high-quality PureColor LCD II screen featuring a wide viewing angle, anti-glare and anti-scratch coatings. You also get face detection (the camera automatically picks out, focuses on and adjusts exposure for one or multiple faces in a composition) and primary face selection control. The PowerShot G9 has a standard Canon top-mounted hotshoe which is compatible with the complete range of Canon EOS speedlites. The ubiquitous Print/Share button is also present and provides access to direct printing and downloading, plus ID Photo Print and Movie Print with compatible Canon PIXMA Photo Printers, and Canon CP and SELPHY Compact Photo Printers. The G9 is heavy enough for Canon to have added a pair of strap lugs which bear testimony to the fact that this weighty little guy is a bit too beefy for standard wrist straps. If you have to use a wrist strap, we recommend the UpStrap version with its wired, split-ring attachment assembly. The Canon PowerShot G9 is identical in every outward respect to its G7 predecessor. The fun begins with some improvements on the inside and ends with a general increase in image quality. If you're wondering how much image quality you can squeeze out of a little camera like this, have a look at this high dynamic range winter photo. The image is as-shot—unretouched, completely noise-free and quite striking at ISO100 and -0.3ev, handheld, IS on. 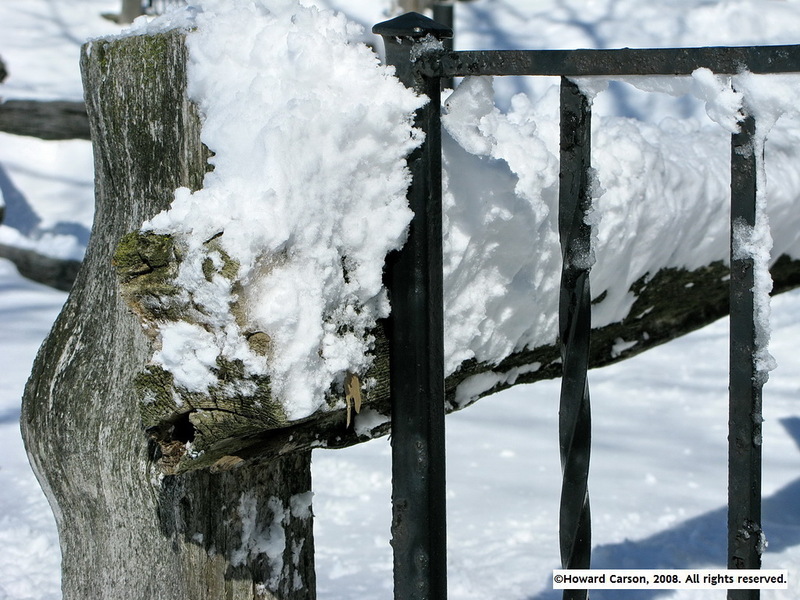 Note the corrosion bubbles just under the surface of the black wrought iron fence, and the enormous amount of contrast between the fading painted black surfaces and the fresh white snow. The midtones are captured well too, with clean, interesting details in the shadows, the dense texture of the split rail fence and the highlights popping off the the ice and snow crystals without being blown out. One example does not tell the tale obviously, but this is a very nice camera indeed. For five hundred bucks you get rock solid controls, superb DIGIC III programming by Canon, excellent construction, a wonderful lens and full compatibility with SDHC storage cards. The Canon PowerShot G9 is meant to be used daily, frequently and for a very long time. During a four week review period I loaned it to a number of different people who regularly use a digital camera in the course of their day to day work—a real estate broker, an electrician, a high school science teacher and a structural engineer. The broker commented on how tough the camera seems to be, how well it held up rattling around in a half empty briefcase, and how its almost true wide angle lens proved useful for shooting in relatively cramped interior situations and for easily and consistently producing publishable exterior shots. The electrician commented that the camera focused well and the built-in flash did a good job of illuminating but not blowing out photos taken in cramped, dark hydro vaults and electrical panel rooms. The electrician was also impressed by the fact that the G9 didn't seem to scratch easily while on the job. The science teacher loved the quality she got out of the macro mode, especially when shooting experiments and illustration examples for printing. The engineer loved the camera because it functioned reliably, predictably and produced high quality images in a wide variety of shooting conditions for a wide variety of large subjects (ramps, buildings, underground parking garages, foundation walls). What I like most about the PowerShot G9 is that I can leave my Nikon D60 and D300 in the car (or at home) on days when I'm unsure about how much time I'll have for photo ops but still want a good quality camera ready to fire at a moments notice.